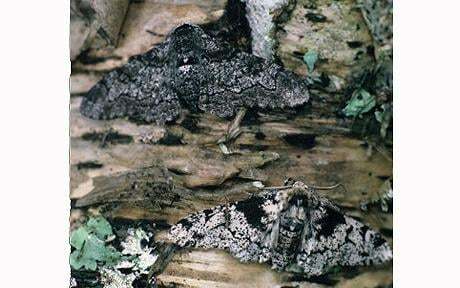 The Peppered moth, which changed its colour from white to black in areas of Britain with heavy pollution, is now reverting back to its original appearance. The moth was white with small black speckles but over time it evolved to being almost black in parts of the UK because of heavy industrial pollution. The change made it less obvious to predators against backgrounds of grime and soot. Having declined by more than two thirds compared to 40 years ago, it is regarded as a classic example of natural selection and has consequently become known as "Darwin's moth." Now in post-industrial Britain, 200 years after Darwin's birth, the moth is changing back to its original white colour. Scientists at Butterfly Conservation, based in Dorset, are now appealing to the public for help in finding out how widespread this change has become. As part of Garden Moths Count 2009 they want people to search their gardens for the moth and log their sightings. "We have seen these moths making a big swing back to their original colour," said Richard Fox, project manager of Moths Count. "It has been happening for decades as air pollution is cleaned up and with the demise of heavy industry in the big cities. "The moths have been responding to this and the numbers of black and white moths will vary across the county. "In Dorset it is very rare to see the moth in its dark form, but in industrial cities 150 years ago they were almost all black and that's where we will notice the greatest changes now." He said they were also hoping to discover why the moth has been declining so dramatically since the 1960's. "It's an iconic moth, the one that everyone learns about at school because it is such an amazing example of natural selection," he said. "But it has actually undergone a major decline of 61 per cent since the 1960's and we don't know why. "We will be fascinated to see where people are finding the two different forms of the moth and whether in fact people are finding it in their gardens at all." Moth experts are also asking the public to look out for the beautiful day-flying Scarlet Tiger, which until recently was rarely seen outside South West England and South Wales. In recent years the moth has spread to further parts of Britain as a result of climate change. Scientists want to access how far they have flown to access the impact of climate change on our wildlife. Garden Moths Count is part of the national Moths Count project, established after research indicated massive declines in moth numbers, especially in the southern half of Britain. Some people are put off moths by the myth that they all eat clothes. But in reality only half a dozen of Britain's 2,500 moth species do this - and they prefer dirty items that are hidden away in the dark in places where they are not disturbed. Mr Fox added: "Moths are important indicators and observing them can tell us a lot. "They are an essential food source for many birds and they are important pollinators in the garden. "Some are very beautiful and, despite their recent decline, there are still very colourful moths to be seen in all of our gardens."